The U.S. Geological Survey (USGS) analyzes supply chains to identify and define major components of mineral and material flows from ore extraction, through intermediate forms, to a final product. Two major reasons necessitate these analyses: (1) to identify risks associated with the supply of critical and strategic minerals to the United States and (2) to provide greater supply chain transparency so that policymakers have the information necessary to ensure domestic legislation compliance. This fact sheet focuses on the latter. 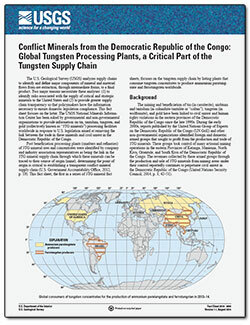 The USGS National Minerals Information Center has been asked by governmental and non-governmental organizations to provide information on tin, tantalum, tungsten, and gold (collectively known as “3TG minerals”) processing facilities worldwide in response to U.S. legislation aimed at removing the link between the trade in these minerals and civil unrest in the Democratic Republic of the Congo. Post beneficiation processing plants (smelters and refineries) of 3TG mineral ores and concentrates were identified by company and industry association representatives as being the link in the 3TG mineral supply chain through which these minerals can be traced to their source of origin (mine); determining the point of origin is critical to establishing a transparent conflict mineral supply chain. This fact sheet, the first in a series of 3TG mineral fact sheets, focuses on the tungsten supply chain by listing plants that consume tungsten concentrates to produce ammonium paratungstate and ferrotungsten worldwide. Bermúdez-Lugo, Omayra, 2014, Conflict minerals from the Democratic Republic of the Congo—Global tungsten processing plants, a critical part of the tungsten supply chain (ver. 1.1, August 2014): U.S. Geological Survey Fact Sheet 2014-3069, 4 p., https://dx.doi.org/10.3133/fs20143069.